While the V-2 is perhaps second only to the atomic bomb as the most complex piece of hardware produced during the Second World War, it’s interesting to see just how low-tech certain elements of the rocket really were. To modern eyes, the construction and handling of these deadly rockets seems amateurish to the point of being nearly comical. Some of that is due to the limitations of the era, as the V-2 was pushing contemporary technology to the absolute limits. But it’s also important to remember that V-2 was designed as a weapon of war, to be operated on the front lines by soldiers who up until this point probably didn’t have first-hand experience with anything more complex than a tractor. The V-2 wasn’t treated with the respect one affords an instrument of scientific endeavor simply because it wasn’t one. Tightening a gap on the V-2 that widened during fueling. The rockets get jockeyed around with whatever means were available, such as the general purpose portable crane and ropes used to unload them from rail cars when they arrive at the launch site. Often men grab hold of the rocket’s fins and simply yank the vehicle into position. When disconnecting the frozen liquid oxygen lines from the rocket, they are beaten with hammers to loosen them up. All the while, several of the German soldiers can be seen with cigarettes dangling from their mouths. These men weren’t rocket scientists in the literal or figurative sense of the term, and yet they managed to send over 3,000 V-2’s towards their targets in a span of less than seven months. But the way these rockets were handled during the war isn’t the only surprise documented by Operation Backfire. Seen up close and personal as it is in this film, the rough-hewn nature of the V-2 itself is readily apparent. The skin of the rocket is dimpled and wrinkled, panels are ill-fitted to each other, and under the stress of movement and fueling some of the joints open up enough that a worker needs to climb a ladder and tighten them before the rocket is launched. Built with great haste and often by slave laborers in abysmal conditions, the failure rate for the V-2 was exceptionally high. 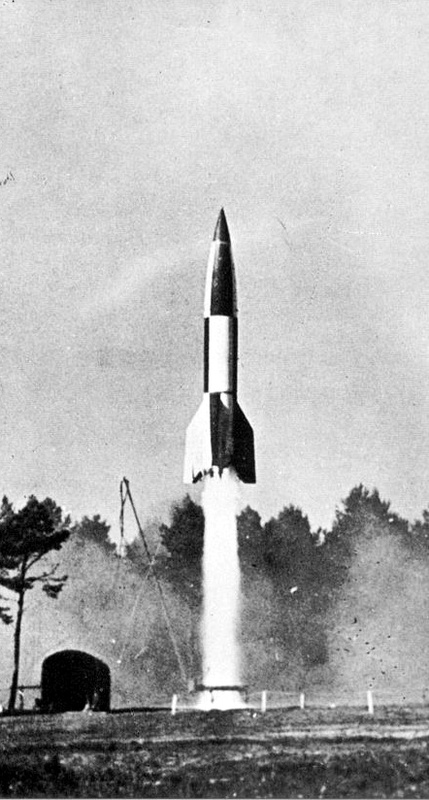 According to research conducted during Operation Backfire, the Germans learned to launch each V-2 within 72 hours of its assembly; any longer than that and it became increasingly unlikely to function. 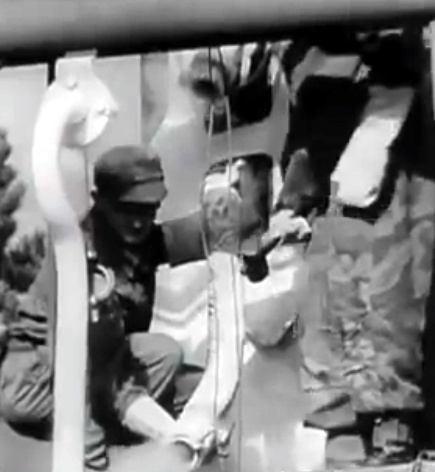 Men handle the frozen LOX lines of a V-2. While the V-2 and the men who operated them may lack the sophistication we associate with modern rocketry, one can’t help but notice similarities between these grainy black and while recordings of early launches and the ones we watch live streamed on the Internet today. Details which may now seem obvious were then yet to be fully understood, and every V-2 that managed to crawl its way into the air was another lesson learned. While the men in the film likely didn’t realize it at the time, they were discovering the protocols and best practices that are still in use over 70 years later. 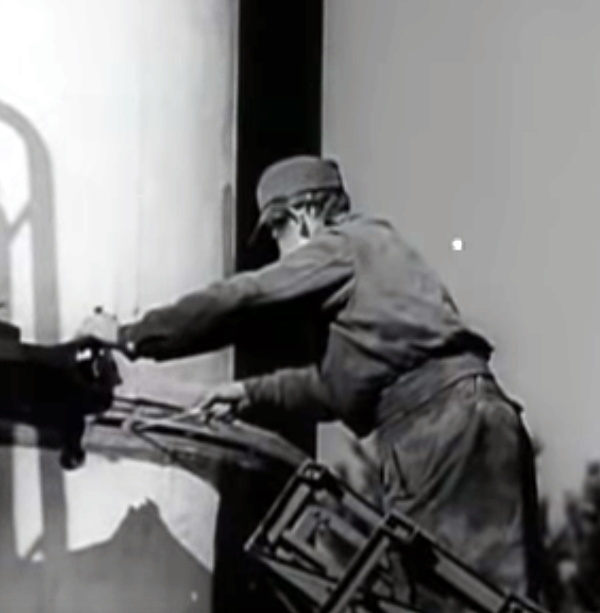 For example, the film takes the time to explain why the rocket can’t be loaded with propellant until it has been erected vertically on the launch pad. Just as with modern rockets, the internal tanks of the V-2 could only support the massive weight of the propellants when they were standing upright. To an audience in 1946 this would likely have seemed a very strange way to design a vehicle, but today we understand it as standard element of rocket design. Similarly, the film explains that the German teams who fired the V-2 found that they had the best results when loading the frigid liquid oxygen (LOX) into the rocket as close to the launch as possible. Ideally, within one hour of liftoff. Any later and not only could too much of the liquid oxygen be lost to boil off, but the valves inside the rocket had a tendency to freeze solid. Yet as recently as 2016, SpaceX was still struggling to find the proper time to load supercooled liquid oxygen into their Falcon 9 booster; with a series of launch aborts due to liquid oxygen being loaded too soon. Even to modern eyes, there’s something almost perverse about The German A.4 Rocket. Seeing Wehrmacht soldiers preparing a V-2 rocket as if it was about to be sent screaming towards London at Mach 4 is bit like watching captured Islamic State fighters demonstrate the construction of a roadside improvised explosive device. It’s hard to imagine how someone watching this film in 1946 would have felt about what they were seeing, especially those who lived in London or Antwerp during the V-2’s operational use. To be sure, the circumstances surrounding the creation of this film are nothing less than extraordinary. We cannot afford to be complacent about the rocket and its potentialities in the future. The record of this film is a warning that we’ve got a lot to think about. Just last week I saw the silver Operation Backfire V2 model in the officers mess at RA Larkhill, UK. Wasn’t the A4 also the first man-made object ever to travel faster than the speed of sound? Read a memoir by a Brit war planner who said he was, in a sense, glad the Germans were building and firing these rockets at them: each cost as much as a fighter aircraft but could only be used once. That’s a little harder to say. Supersonic projectiles (I.E. bullets, artillery shells) were certainly in use before the A4, and of course small solid fuel rockets were being launched for hundreds of years at that point and some of those probably moved pretty quick. But it’s certainly safe to say the A4 was the first vehicle to accelerate to supersonic speed and sustain it for any length of time. Say what? Are you referring to fireworks rockets?? Well, they certainly started as fireworks. Beyond that there’s arguably some room for interpretation as to when military rockets truly became practical, but certainly by the late 18th century they had moved from being a novelty to actual weapons. Rockets weighing 30+ pounds were used during the Napoleonic Wars, and several WWI aircraft were fitted with rocket launchers for use against air and ground targets. Of course the exact performance capabilities of these rockets have largely been lost to time, but it’s certainly fair to say they were the fastest moving man-made objects of their respective eras. That would be the whip. Wikipedia has. a (meta) reference for that. Most casualties were slave labourers: prisoners of war and other people considered as sub-humans by the Nazis. I wonder how many of those Nazis escaped because they were considered “valuable” by the allies. Inner rat lines, so to speak. technically, NO. P51’s, P47’s and other aircraft in a dive could exceed the local speed of sound but since the shockwave caused tremendous nose up pitch, after breaking the sound barrier, the craft would usually disintergrate. WWII-era fighters could not exceed the speed of sound. As the aircraft accelerated in a dive, it would encounter compressibility, AIRFLOW over some parts of the plane would exceed Mach 1 and create shockwaves which increased drag. The aircraft itself never exceeded Mach 1. Don’t care if you don’t think it’s true. Facts are facts and whatever you’ve “heard” is incorrect. Okay, then show us YOUR facts and figures. Oh, I see. You saw it in a movie. Well, that settles it then. First, I’d like to apologize to Alax99a for my last “don’t care” comment. It was a knee-jerk reaction, and not my usual style. Turns out, it was pure fiction, and mostly about tests in a jet fighter. Well, hey, that _WAS_ 67 years ago, after all. My (apparently) faulty memory was thrown off by the opening scene, which did show our hero diving a Spit, and experiencing control reversal. In April 1944, Squadron Leader Anthony F Martindale reached Mach 0.92 … right before that huge 4-blade propeller ripped off. Someone else here said that the aerodynamics near Mach 1 caused a sharp pitch-up. That is indeed what happened, but it wasn’t because of aerodynamic changes. It was because the loss of the prop moved the c.g. back, which made the aircraft unstable in pitch. Fortunately, the pitch change took the aircraft to 40,000 ft , so Martindale survived. Next up the history of anti-missile technology. The never ending cat and mouse. Great article! The pace of modern technology never ceases to amaze. It’s why we can’t affort to underestimate the rapid development of things like AI. Despite the false starts and overblown marketing, there is just as much potential for both good and destruction. But to be fair, sometimes he also hit the moon. At the Soace & Rocket Center in Huntsville, take a look at the V2 and the Redstone side by side. The designs are virtually identical, up to and including the non-gimballed engine and thrust vector control via steerable carbon vanes. The most amazing thing: Mercury astronauts rode into space on those things. The vanes are graphite. The way they work is quite impressive. Absolutely, it’s really hard to overstate how influential the V-2 was to post-war American and Soviet rockets. Both sides essentially started with cloned V-2s, and then evolved the design from there. Since many of the top engineers German ended up in the US, you could say that our designs stayed a bit closer to the lineage of the V-2 program, while the Soviets had their own ideas on how to improve the design. Ultimately the Soviets came up with more advanced engines and rockets, but the US versions were (comparatively) cheaper and more reliable. In the short term it got American boots on the Moon, but in the long run the engine technology developed by the Soviets is still being used today in Russian and American rockets. Yeah, I agree. We tended to go with large single or few main engines, where the Russians just used lots of smaller engines. I know that NASA-Marshall had _LOTS_ of problems getting the Shuttle engines to work. Apparently rocket fuel injectors, combustion chambers, etc. just don’t scale up very well. From SpaceX’s designs, it looks like many small engines is the better approach. When it comes to the rocket motor side of the equation, it was neither cheapness nor reliability that got Americans to the moon. It was hydrogen. If anything the Soviet rockets were cheaper than the US counterparts, but the Soviets concentrated on Kerosine and hypergolics and never developed hydrogen fueled rockets the way the US did. The US was able to leverage a lot of prior work on bulk hydrogen production and storage as fuel which made the large scale use of it and its higher specific impulse in a big rocket feasible, while in the USSR personality driven infighting, structural drawbacks from the bulk of LH2 tankage and limited experience with LH2 meant it lost the argument in favour of kerosine. The Soviets didn’t develop a good super heavy lift LH2/LOX motor until the RD-0120 in Energia. By then it was all over. Now, just to be picky, only the second and third stages of the Saturn V were fueled with liquid hydrogen. First stage was RP-1, aka kerosene. Also, the means for mass production of hydrogen were well known and well developed, worldwide. Furthermore, hydrogen still isn’t the uncontested leader in rocket fuel. Liquid methane and RP-1 continue to be contenders in big boosters, as are solid fuels. There are benefits and disadvantages of every fuel/oxidizer pair. I should also point out that the low numbers of motors launched makes it very hard to judge comparative reliability. For example, the F1 in the Saturn V had a “Flawless” launch record, but only 65 motors functioned in flight. On the equivalent Soviet N-1 rocket, which had a 100% failure rate, 120 NK-15 motors funtioned in flight, only one of which appears to have failed. If eleven more Saturn V had been launced, would one F1 have failed? I’d like to say no, but who knows. Um. . . it was not the first man-made object in space. During The Great War, some shells from Germany’s huge Paris gun reached space on their way to Paris. No. A simple Google search before posting this comment would have saved you embarrassment. Shells from the Paris Gun entered into the stratosphere, the highest anything had reached at that point, but that’s not space. The karman line “defines” space for international treaty purposes; but where space begins is arbitrary and arguable. If you want to see how rough the surface of a V2 really is, there’s one in the Science Museum (London) that you can get up close to. It’s in the Making the Modern World gallery. The skin is really quite wrinkled and dented! Also, if it is still there, the National Air and Space Museum has one. Lots of dents from the slave labor banging on metal. Some good examples of the ripples (yes, some is transport damage, but most is original, IIRC) is on this site. V2 launch site, awesome building, with an awesome museum up top that follows the development from early V1 to V2 to the space race. The story goes, when the V1 was having stability problems, she had one outfitted with a seat and flew it. According to Wikipedia, she trained volunteers to form a suicide team. and after watching this very interesting video, links after links, I also discovered the life and work of Frank Whittle, english pionneer of turbojet engines ! The V-2 didn’t have an inertial control system as we think of one today. It had no accelerometers at all, only two gyros to determine the pitch and yaw attitude angles. So questions like wind gusts or thrust variations were moot. The vehicle simply followed a pre-programmed pitch profile — I presume a pitch angle vs. time. That’s covered in the video, though they don’t describe what medium was used to store the profile. The V-2 was horribly inaccurate, but it was still effective, if only because of the fear factor. But their accuracy really WAS pretty poor. It’s only because they were targeting large population areas, that these were effective at all. Not only could they not compensate for wind drift, but since the steering was by carbon vanes in the exhaust, they only guided the trajectory during the burn phase. Once the rocket motor was out, they were purely ballistic. But keep in mind, by the time the rocket motor was out, not only were they in near-vacuum, but they were going fast enough that once they were back in air, wind didn’t have much time to push them around, and the stabilizing effect of fixed fins kept them going in a straght-ish line. According to Wikipedia, “The V-2 was guided by four external rudders on the tail fins, and four internal graphite vanes in the jet stream at the exit of the motor. The LEV-3 guidance system consisted of two free gyroscopes (a horizontal and a vertical) for lateral stabilization, and a PIGA accelerometer to control engine cutoff at a specified velocity. So it looks like there _WAS_ a single accelerometer on board, but it only measured axial acceleration to cut off thrust at the desired delta-v.
Definitely the graphite vanes would be needed for thrust vector control during takeoff, since the engine itself wasn’t gimballed. I’ve not been able to find anything concerning how the attitude control job was shared between the rudders and vanes. Looks like I was passing on bad information, then. Yes, it does appear there were rudders on the fins. My guess would be that they were rigged in tandem with the thrust vectoring vanes. This would mean that there would have to be a programmed profile for attitude, but that’s well within the technology of the time. Yes, there was indeed a programmed pitch profile. Not sure how they stored it. Knowing the German penchant for hardware, it could have been something as simple as a clock-driven cam.